"...the best system I've come across for getting our data on the web. And I am particularly impressed by WebMerge's handling of long fields (some of ours are up to 50,000 characters). "On my first use of the full program yesterday, WebMerge generated 4.5MB of clean, error free HTML in less than 9 seconds. 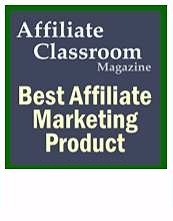 "...easy, low-cost Web publishing software to create a database-derived site that doesn't require any complex Web database infrastructure." "Webmerge is one of those software programs that you wonder 'Where has this been all my life' after you use it." WebMerge works with any database or spreadsheet that exports in tab-delimited, Merge, or other tabular format, including FileMaker Pro, Microsoft Access, and AppleWorks. Using HTML template pages you can make with your favorite authoring tool, WebMerge makes a new HTML page from the data in each record of the exported file. WebMerge can also create index pages with links to each of the detail pages. Generated pages can be hosted on any Web server - even AOL - without the need for a specialized database hosting solution. WebMerge requires no DLLs, extensions, CGIs, or other components. Everything you need to start generating pages is included in one easy-to-use application. A wide variety of businesses, universities, and other organizations rely on WebMerge daily, ranging from Web designers to the US Library of Congress. Most of our customers tell us that WebMerge paid for itself with the first project they used it on. "This is a GREAT product . . . powerful, logical, intuitive, and reasonably priced. I love it." "After downloading WebMerge in 2003, we were able to add more products than we have ever had, combined. WebMerge has been an easy, flawless addition to our "staff", and it was a great investment at a low price." "Perhaps the most wonderful aspect of WebMerge is the ease of making updates. Make a quick change to the data, click a couple buttons...and it is done." CSS support has been added to tables. You can now specify CSS classes for the table, row, and cells with the TableClass, RowClass, and Cell class tags, respectively. The new WM-BBCode tag allows you very simple BBCode syntax in your database fields to describe web content. Improved performance of the modulo operator for the WM-If tag. 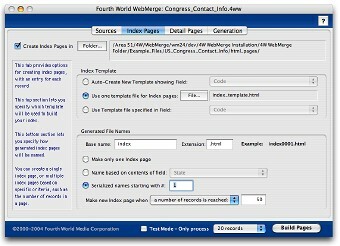 WebMerge now handles pagination of index files more robustly with some combinations of settings. Improved FTP Settings window in both appearance and functionality. Fixed bug in which index number serial numbers weren't padding correctly if the padding options were chosen. Added better error-checking in the Sources tab setting delimiters. Various other enhancements and bug fixes. All reproducible issues have been addressed for this release. The options for creating and naming Index pages have been completely revised to allow greater flexibility and control. Enhanced compatibility with Windows Vista and Mac OX 10.5 (Leopard). Optimized performance on Intel-based Macs. This is the first version of WebMerge available for the Linux operating system. Improved auto-discovery of source file formats: When loading a source file, WebMerge will examine the format of the file and attempt to set the delimiters in the Sources tab appropriately. For most common formats, this will automatically set them up correctly, but the user can still change them if needed. Improved generation of tables on index pages. In earlier versions it was possible to use certain combinations of tags and settings which would cause WebMerge to fail to generate the closing </table> tag for generated tables. At this time all known issues with table generation have been resolved. Added a new maxLen attribute for the WM-Field tag to truncate text from a specified field to a given length. Text is truncated on word boundaries to preserve readability, and any trunacted text is indicate with the addition of an ellipsis at the end if it. This option can be useful when you want to display a portion of things like long product descriptions. Generated files names now allow a greater range of characters. Earlier versions were too conservative in disallowing characters which cannot be used in valid files names on web servers. Version 2.5 now generates pages using the full range of allowable characters. A new len function has been added to the WM-If tag to allow comparisons on the length of data in a given field. Added a new Preferences window, available as the last item in the Edit menu.This window is now where you can change the hyphenation option, which lets you choose to have WebMerge replace invalid characters in file names with a hyphen (default) or underscore. This functionality was formerly in a tool named "Hyphenator" in the Tools menu. Added new option to Preferences to set the line endings for generated pages. By default, WebMerge will generate pages using the line endings native to the platform it's running on (CRLF for Windows, CR for OS X, and LF for Linux). This new Preference option lets you change this default behavior if you need to integrate your pages with other tools which may require specific line endings. Fixed bug in which saving a file with no source would generate a "Cannot find source file" next time the file was opened in WebMerge. Various minor bug fixes. All reproducible issues have been addressed for this release. Because you can save your WebMerge settings to a file, you can easily set up even complex workflows that can be run by others with no training - if they can double-click a file, they can run WebMerge. Corporations, universities, even private Web designers can set up publishing systems for their clients and customers, or trade work with other team members. WebMerge files can be used on either Mac OS or Windows, so you can share your work with anyone who has a licensed copy of WebMerge. Check out the WebMerge FAQ. For details on using WebMerge click here to open WebMerge Help files included in the free download. Each new release of WebMerge is driven by requests from people like you. If there's a feature you'd like to see, drop us a note or use our Feedback Form. At most major search engine sites, the frequency of keywords in your page contents will play a major role in determining ranking in results of keyword searches. Most search engines can't index database contents. If your site's content is delivered dynamically from a live database relatively little of your site will be indexed. Searches that should have helped users find your page may pass your site right by, since your content was effectively invisible to the search engine. WebMerge generates static Web pages that are easily indexed by search engines. Standard HTML copied from your own templates, WebMerge-generated pages can make effective use of the title, meta tags, and of course the body text to help search engines give your site's content appropriate ranking. We have some customers who use WebMerge to create mirrors of their database-driven content to help ensure their site is properly indexed.